I never skated Amateur for Sims but went straight to Pro status. 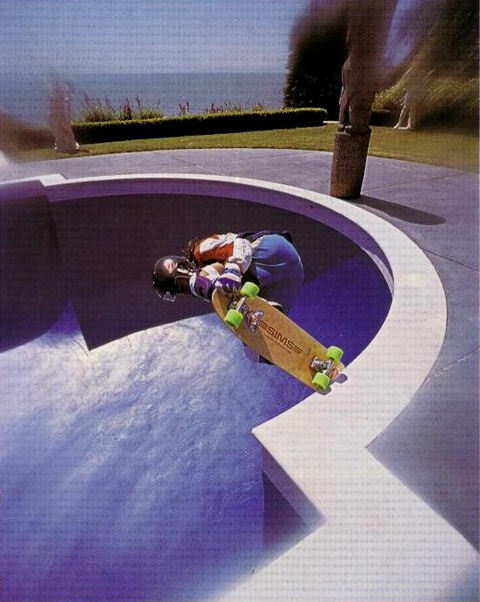 My first ad for them was the Snake Ad "I was the guy doing the frontside air next to mark Hollander. I soon began to pick up other sponsors such as Vans, Pepsi, Rector, Protec, Tracker Trucks, Tracks, and many others. Tom credits his biggest influences as Lonnie Toft and Gordy Lienemann..."They pretty much took me under their wing and puppied me along during my young pro career. The greatest times were driving around different spots in California with Tom Sims, Lonnie, Craig Fineman and other Sims guys doing photo shots or movies. Some of the best days of my life". My early years will help to understand my story; my Sister died when he was 13, from a heroin overdose. My mother died from Cirrhosis of the liver (Booze) when he was 16. I took first place world championship comp for bowls and half pipe. With the coming of Oxnard competition, I was a contender to take first. When it came time for the competition I walked away from it and said to myself 'there has to be more to life then this'. I had reached the goal that I set out for to be pro and I was still not happy. I went on a party binge, chasing girls and spending money like it was in style and ended up broke, homeless and strung out on drugs and booze. I ended up in front of markets, skating, begging and stealing to get that next fix or bottle. In and out of jail and rehabs it seemed I was destined to be like others in my family. At the age of 23 I lost my son to SIDS sudden infant death syndrome; it seemed there was a black cloud that was following me and everything i touched or loved left me. Tom still travels all over the U.S. promoting skateboarding at skate shows, hosting skate camps, outeaches and showing the latest wares from his sponsors. Tom's passion for the eight has never faded and he continues to be one of the premier skaters (both on four wheels or eight) hitting the crete today. His sponsors as of 2010 include SAP skateboards, Globe, Tracker Trucks, Veteran SKates, Ironfist helmets and pads, Ritalin Bearings, Yocaher wheels, Navigator, and Changing times.